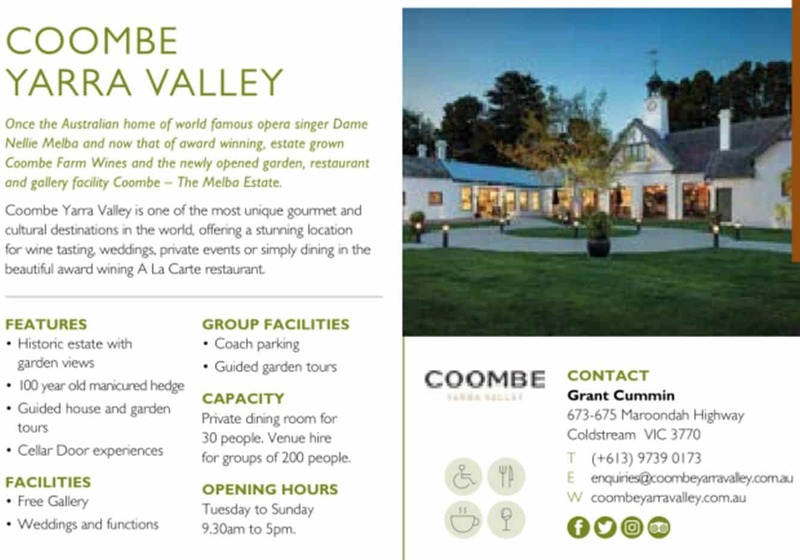 Regarded as the most innovative winery in the Yarra Valley, Coombe Farm is a must-visit destination. The vineyard is known for its vast production of both traditional and exotic grape varieties. Coombe Farm offers a stunning location for wine tasting, weddings, private events or simply dining in the beautiful a la carte restaurant. The Vestey family started this winery with the goal of producing the finest grapes to create authentic wines. After doing an extensive research on the wine making process, the winemakers were able to find the best grape varieties and developed a range of sparkling wines from their estate grown grapes. Years later, they were able to fulfil their dreams and emerge as a premium wine maker in Victoria. Coombe Farm uses gentle methods of wine making that include minimal filtration and refining so that their wines come with a persistent flavour and seamless texture. Visitors should taste their quality varieties including pinot gris, arneis and viogner. Come here for lunch at the onsite restaurant and enjoy a tasty selection of seasonal and estate grown produce for brunch, lunch and afternoon tea seven days a week. With seven acres of manicured gardens Coombe Farm’s breathtaking venue overlooking the rolling slopes of the Great Dividing Range sets an inviting atmosphere in which visitors can indulge. Popular for weddings and other celebrations, Coombe Farm has the perfect backdrop for hosting a special event. If you are looking for accommodation in the Yarra Valley, click the link below for the best accommodation deals. Tasting is free for most wines with a small charge that is refundable on purchase of certain varieties. Unfortunately we don’t take lunch bookings on behalf of Coombe Farm, so you will need to contact them directly.